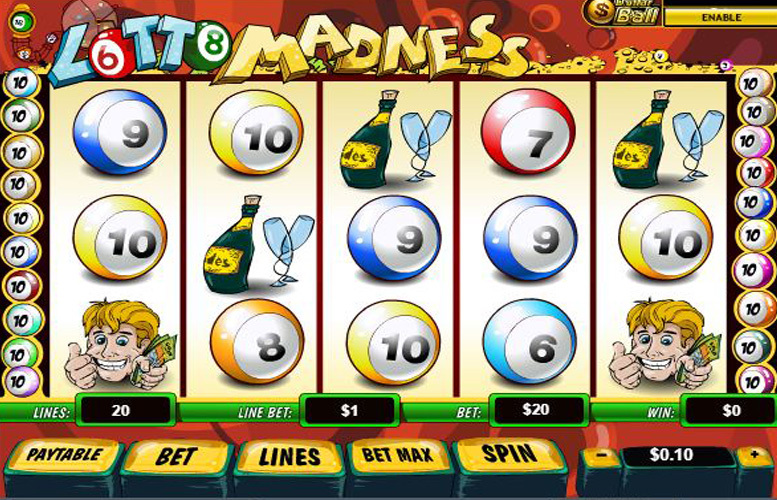 The Lotto Madness slot machine from Playtech is all about big wins. It’s based around the theme of lottery winners. Expect champagne, excitement, and winning tickets. There’s a suitably big prize on offer too and if players activate the progressive jackpot, they’ll be in with a chance of winning a lifechanging sum of money. Apart from the chances to win huge, the game is a basic one. There are limited features, and unless constantly being in with a chance of dropping a huge prize is enough excitement for you, you’ll likely get bored quickly. Progressive jackpot. Need we say more? Five, six, or even seven figure wins are what this machine is all about. Decent sized winnings from regular symbols. The top main game prize is a juicy 10,000x the line bet. Very basic art style. There isn’t a great deal of atmosphere created by either the design, or the music choice. This limits the possible enjoyment factor when contrasted with many other slots. Lack of bonus features makes for a game that gets old fast. Wild card lotto ticket (wild) = 10,000x the line bet. Stacks of cash = 1,000x the line bet. Champagne = 500x the line bet. Excited man = 400x the line bet. One of the most limiting aspects of this game is its lack of features. It’s a very basic machine where the top prizes are awarded for large value symbols hitting many times across a single win line. That’s where the value is, not in the frankly underwhelming bonus round. The machine does have a bit of a saving grace, however. This is in the form of its progressive jackpot feature. If players can successfully land a bonus symbol on both the first and last reels at the same time, they will trigger the bonus round. A wheel of fortune spins and awards various prizes. Players can choose to opt in to the progressive jackpot or not. There is an option to do so in the top right corner of the game screen. Once activated, additional symbols will appear on the reels. These “$ Ball” logos must be matched to win. Hitting four of them across a win line will win 1% of the entire jackpot, and hitting all five will take down the whole thing. Number six = 300x the line bet. Number seven = 250x the line bet. Number eight = 200x the line bet. Number nine = 150x the line bet. Number ten = 100x the line bet. Despite how rough we’ve been on Lotto Madness during this review, the game does allow players maximum scope when it comes to sizing their bets. It’s possible to adjust the value of each coin, the number bet per win line, and even the number of win lines available. With all the values set to their absolute minimum, the lowest possible bet is just 1p. That’s one line, one coin bet per line, and the value set at 1p. With all the variable maxed out, the highest bet available is an impressive £2,000. This would involve each coin being set to £10, betting ten of them per line, and using all 20 possible win lines. As you can see, Lotto Madness caters to literally all wallets. 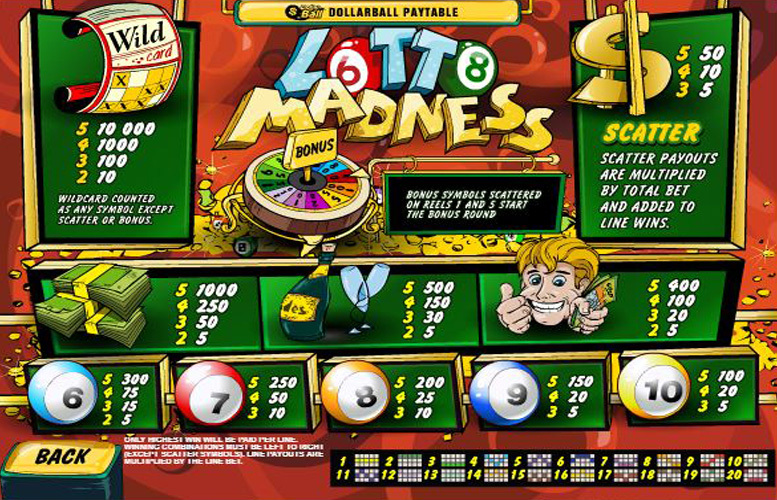 If stripped back, basic slot machines are your thing then Lotto Madness might well be for you. However, if you’re more found of varied bonus games and more chances to win small prizes, you’ll probably find the games limitations quickly. All told, besides the progressive jackpot there is little to get that excited about this game, and there are plenty more entertaining offerings from Playtech. This game has a rating of 3 / 5 with 514 total reviews by the users.